An incomplete set of teeth causes problems for absolutely everyone. Food choices become limited, speech feels more awkward, and simply smiling suddenly turns into a source of anxiety. All of these problems can be fixed by replacing any missing teeth, and at Chisholm Trail Dental Health, we’re experts at doing exactly that. Whether you’re down just one tooth or an entire arch, Dr. Asay can create a solution designed just for you. Thanks to him, it will seem like your teeth never went missing in the first place! To learn more about your replacement options, give us a call today. Why Choose Chisholm Trail Dental Health for Replacing Missing Teeth? Just like their name indicates, dental bridges work by literally “bridging” the gap left by one or more missing teeth in a row. Dental crowns placed on either side of the prosthetic securely anchor it into place, and they can hold 1-4 replacement teeth. 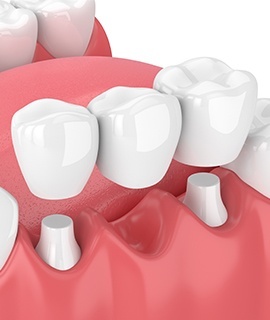 Not only can bridges help patients reclaim their normal appearance, but also restore their regular chewing function, plus they prevent the neighboring teeth from drifting out of place. Countless generations of people have relied on dentures in one form or another to replace several missing teeth, and today, they are more comfortable and natural-looking than ever. Specially-made ceramic teeth are attached to a gum-colored acrylic base, creating something that both fits securely in the mouth and enables a patient to eat and smile with complete confidence. 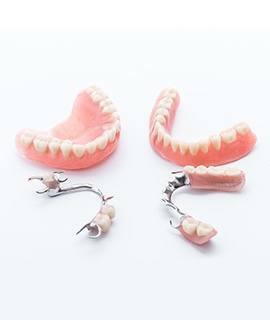 We can provide partial dentures for patients who still have some remaining healthy teeth or full dentures for those missing an entire arch. 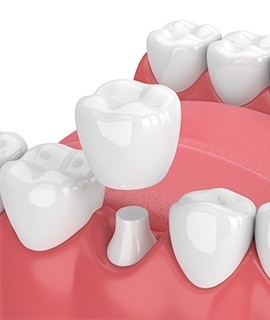 Over the past two decades, dental implants have become the gold standard of tooth replacement, and that’s because they do something no other treatment can: they bring back the entire tooth. Regular replacements only restore the crown, or visible portion, while implants replicate the root structure below the gum line as well. The end result is something that perfectly mimics a natural tooth both visually and functionally, helping a patient eat, speak, and smile without ever having to think about their dental work.